با درنظر گرفتن طیف معنایی گستردۀ مفهوم «توسعه»، چنین به‌نظر می‌رسد که رفع معضلاتی مانند فقر، گرسنگی، ناامنی، و درنهایت، برقراری عدالت، در گرو دستیابی به توسعه است. دو دسته از نظریه‌های توسعه‌ای که چگونگی دستیابی به اهداف پیش‌گفته را صورت‌بندی کرده‌اند عبارتند از: «نظریه دولت توسعه‌گرا» و «ایده‌ حکمرانی خوب». 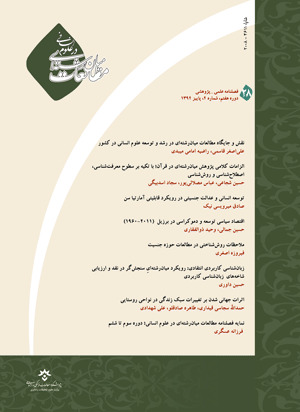 درحالی‌که طرفداران دولت توسعه‌گرا دستیابی به توسعه را مستلزم وجود دولتی قدرتمند و دارای قدرت اجرایی فراوان می‌دانند، طرفداران ایدۀ‌‌ حکمرانی خوب، توسعه را در گرو ارتقای کیفیت حکمرانی و ایجاد فضای اعتماد میان دولت و شهروندان درنظر می‌گیرند. این دو دسته از نظریه‌ها، چالش‌های تئوریک عمده‌ای با یکدیگر داشته‌اند. این مقاله، با بررسی این چالش‌‌ها به این نتیجه رسیده است که نظریۀ دولت توسعه‌‌گرا و ایده‌ حکمرانی خوب، هیچ‌گونه منافاتی با یکدیگر ندارند، بلکه دولت توسعه‌گرا پیش‌نیاز حکمرانی خوب است. لفت­ویچ، آدریان (1385). به سوی مدلی از دولت توسعه­خواه: توجهی دوباره به سیاست (مترجم: احمد موثقی). فرهنگ اندیشه، 5(19)، 87-59. Chambers, R. (2005). Ideas for development. London: Earthscan Press. Chhotray, V., & Stoker, G. (2009). Governance theory and practice (A cross-disciplinary approach). Uk: Palgrave Macmillan Press. Department for International Development (DFID) (2001). Making government work for poor people-building state capability. UK: Department for International Development Publication. Han, Yong-sup. (2011). The May Sixteenth Military Coup. in The Park Chung Hee Era: The transformation of South Korea. US: Harvard University Press. Evans, P. (1995). Embedded autonomy (States and industrial transformation). New Jersey: Prinston University Press. Haskin, J. M. (2005). The tragic state of the Congo: From declonization to dictatorship. New York: Algora Publishing. Helliwell, J., Layard, R., & Sachs, J. (2016). World happiness report 2016. United Nations Sustainable Development Solutions Network. Johnson, Ch. (1982). MITI and the Japanese miracle: The growth of the industrial policy, 1925-1975. Stanford, California: Stanford University Press. Kohli, A. (2004). State-directed development - political power and industrialization in the global periphery. New York: Cambridge University Press. Mahbubani, K. (2007). From confucius to Kennedy: Principles of East Asian governance. In I. Gill, Y. Haung, & H. Kharas, East Asian Visions: Perspectives on Economic Development, Washington, D.C.: The World Bank: Institute of Policy Studies. Pirie, I. (2008). The Korean developmental state: From dirigisme to neo-liberalism. New York: Routledge Studies in the Growth Economies of Asia: Routledge. Stueck, W. (1995). The Korean war: An international history. New Jersey: Princeton University Press. Wade, R. (1990). Governing the market: Economic theory and the role of government in East Asian industrializati: With a New introduction by the author Edition. New Jersey: Princeton University Press. World Bank (1992). Governance and development. Washington, D.C.: World Bank Publication.